The perfect app for Rugby League Fans! 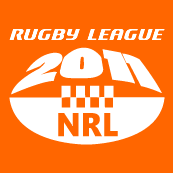 Keep track of the current NRL 2011 Season - complete with Latest Scores, Round-by-Round and Team Fixtures, latest News (for both the entire competition and your club). Nominate your team - and instantly view upcoming matches - complete with Venue details (and Interactive Microsoft Bing Maps). *New* in v1.9 : View embedded live scores + ladders, auto updating fixtures, revamped UI and lots more. 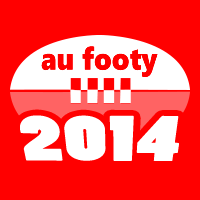 - View Schedules by Date or by Team. - Preloaded Images/Data minimizes bandwidth. - Autoconverts Match times to Your Local Time. Take it for a trial before you purchase (trial version offers cut down fixtures/details). This app uses Bing Maps and downloads latest RSS Feeds (on demand) - and may use additional data while in use. Base Fixtures/Schedules, Logos and Venue images are preloaded into the App (and will not use additional bandwidth) - however live scores, ladders and fixture ammendments will be downloaded on demand. The following comments are a selection of reviews posted for this App on Microsoft's Windows Phone Marketplace by happy customers. New changes are great. Even more useful now. Great app - slick looking and full of features. 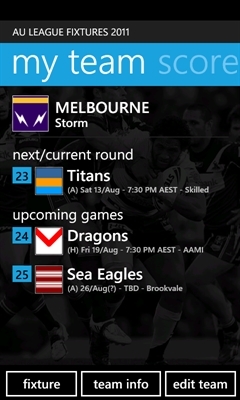 Only NRL app in the marketplace currently. Does the job and is stable. Worth it if you are a keen league fan. 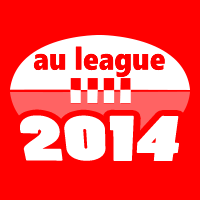 Nb: Above rankings/awards for 'AU League Fixtures 2011' are at time of updating this page.